Except for the occasional sleepover, my kids are always home for the night. 6th grade, though, brings something called "Sixth Grade Outdoor Education", or 6th Grade Camp. Not something I experienced growing up in Northern California, it seems to have been the norm here in Southern California with most of my local friends telling me it was one of the most fun weeks of middle school. My son left for his camp experience 3 years ago with a bundle of mixed emotions. He wanted to go, then he didn't want to go, then he wanted to go, etc. The day of camp arrived and he wasn't too happy to be going, but luckily it was only for 2 nights (budget issues had cut it from four to two). An empty spot sat in my heart for those two long nights, and I was fairly certain that he was homesick. And he was... his experience was anything but "fun" and he was extraordinarily happy to be home. He did however, talk about many of his activities and adventures for hours end, leading me to believe that it was not all bad. Last week, Liv attended her own 6th grade camp and thankfully had a wholly different week doing what she does every day, she "Lived Life" at camp. Not only did she have no reservations about attending the camp and being away from home for the now 4 night/5 day camp, but she literally counted the days until she left. She has never been away from home for more than one night and while she did show a slight reservation about the length of time, she popped out of the car the morning of and was off in a flash. Somehow seeing her leave so happy made it easier for me... for the first 3 days anyway. Then I really, really started to miss her. The house was far quieter, albeit cleanier, my schedule opened up without all the dance driving requirements, and we were all a bit more sedate... boring even. Life was simply different and all of us noticed an emptiness and our days weren't anywhere near as fun. Something was surely missing. Liv had a wonderful week filled with night hikes, rock climbing, all day adventures and really, really bad food. Apparently the pancakes at breakfast were "edible", but the scrambled eggs (which tasted "powdery") were "disgusting". The only good part about the Sloppy Joes was the bread, and the pizza had no taste. Even the ice cream was "just ok". In essence, she said she lived on "edible pancakes, odd tasting chocolate milk, salad and bread" for most of the week. Definitely needing to get some decent food into her we immediately got to making one of her favorite meals, pancakes. My mom-instincts kicked in and I felt a need to load the pancakes with healthy nutrients as we began filling the mixing bowls. Out of the pantry came whole wheat flour, wheat germ, flax meal, rolled oats and cinnamon all combined with a touch of brown sugar. Then we opened the fridge and pulled out fresh milk, eggs and buttermilk. Luckily we even had an over-ripe banana on the counter and we were set! Hungry eyes watched eagerly as I mixed everything together and set the batter onto the griddle. All the while, my more grown up than ever girl chatted to me about her camp adventures, never once mentioning being homesick. As happy as I was that she had such a good time and that my girl is confident enough to go off on her own, I have to admit that my heart was just a touch sad that she didn't seem to have missed me at all. Her eyes lit up as I placed a plate filled with freshly cooked pancakes in front of her and then filled her favorite little pitcher with syrup. She hungrily attacked the plate of food and actually groaned with pleasure at the flavors and tastes proclaiming this the "best meal in the world!". Going back for seconds, she finally began to relax and her eyes grew a bit heavy. Turning to get started on the dishes I suddenly felt something behind me and then felt my heart begin to melt as my little girl's arms wrapped around my waist. She rested her head on my chest and said those words that I had been feeling myslef, "Mom, I love you so much... You can't believe how much I missed you." With tears in my eyes I admitted how lonely it had been without her and how much we had missed her too. Living Life to the fullest is a good thing... but it's always nice to come home. All is now right in my universe. In a medium bowl, combine the buttermilk, milk and oats. Allow to rest for about 20 minutes while you are gathering the other ingredients. In a large bowl, combine the flours, wheat germ, flax meal, sugar, baking powder, baking soda, cinnamon and salt. Whisk to combine. Place the eggs in a small bowl and beat lightly with a fork, then add to the buttermilk mixture. Mash the bananas and add them to the wet mixture, whisking well to combine. Pour the wet mixture into the dry mixture and stir lightly with a wooden spoon just until combined, taking care not to over-mix. Cook pancakes as you regularly do over medium heat... I use an electric nonstick griddle. I don't have to oil my griddle, but you may brush your pan or griddle with a little oil or a quick spray of cooking spray to help with sticking issues. 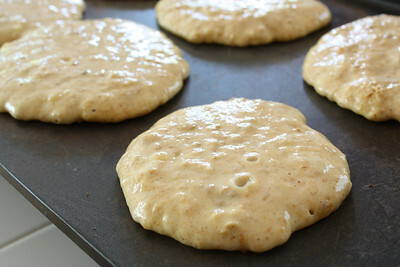 Pour about 1/3 cup of batter onto the griddle and cook until the edges look dry and bubbles begin to form on the top of the pancake. Flip and cook a minute or two more until the underside is browned. Serve immediately, or alternatively, place on an ovenproof plate in a 200º oven to keep warm until ready to serve. Top with maple syrup, butter or your favorite pancake topping! This is a must make for my nephew. At one year old, he's banana crazy! Oh wow- what a touching story!!! I can not believe that they have these weeks away. I'd be a nervous wreck! In Germany they have sleepovers at the kindergartens, but not at my son's. Not sure if he'd like that, though. Those pancakes look and sound so delicious. 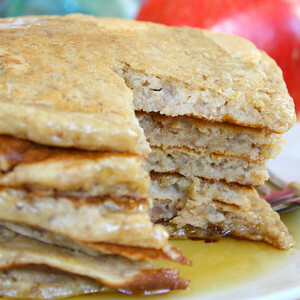 I will have to try them as my children LOVE pancakes and it's the easiest way to add healthy stuff to breakfast!!! I REALLY love the banana and oats added. Will have to try this, too!! Looks delicious! Nice presentation too, lovely story! amazing how healthy these look and still be ultimately delicious too~! Liv really strikes me as such a fun and fun-loving kid. I love that you couldn't wait to get some decent food into her when she got back! We do love to feed our babies, don't we? And these pancakes look like just the remedy for the ho-hum, only-barely-edible food at camp. We're raising the future foodies! Liv has all the signs. A few years ago, Matt and wife had a very expensive New Years dinner. He described every bite. Then said as good as it was, and so expensive, it was no better than the Christmas dinner I had prepared. Don't we have the best kids??!!! I loved the story! Although I still have quite a bit of time left, I am not ready for my little girls to go away for a week long camp. But when they do, I will be like you and miss them like crazy and pray that they are missing me too! The pancakes sound great, I will have to try them out on my little girls! Aww...I'm sure watching Liv grow up with a mixture of pride and sadness that she's becoming an independent young woman! No wonder you're so proud...she seems like a lovely young lady! Healthy, yummy pancakes...after a healthy meal like that, there's less guilt eating one (or three...) of my peppermint truffles. Yes? What a sweetie. I am sure that she is glad to be home with her family, especially with offerings like these pancakes. I will look forward to trying these out soon. Thank you all for the wonderful comments! I am indeed proud of my girl, she truly has a wonderful gift for life and for making others feel appreciated and happy. It's been a really fun day, full of baking, pancakes and lots of hugs! I've got my chicks all back in the nest and Mommy is happy! Funny I was catching up too! I hear you, I hate it when the girls are away, it is sad and lonely. Mine always come home and the first thing out of their mouths are I'm starving! Everyone jokes with my oldest, saying, you are probably the only kid that went to college and lost weight! Glad you are happy again! X-mas is coming way too fast! I need more weekends! And howww sweeettt I nearly got all teary just reading the part about your little girl hugging you and saying how much she's missed you. Aawwwww that is just the sweetest thing. Ok I'm gonna cry now, lol. Have a wonderful Christmas and look forward to catching up with you when I get back!! Awww! Such a sweet post! And such scrumptious pancakes! I want to give you a hug too! Oh Kim, 6th grade outdoor ed! I remember my week of it, but it was in May. Where did Liv's school end up going? Not surprisingly, I'm not too sure where we went now. I do know, obviously, in 8th grade we went to Yosemite, haha! I'm glad she had a great time, as I did, too, but yes, the food was um... enough to get you by. You're such an awesome mother for making these pancakes. My mom would most definitely make something I want for me, too, after being gone for the majority of a week :-) And don't worry, she missed you!!! Amazing seeing our girls grow up! She is lucky to have such an adventure... although... I am the same way when my daughter leaves the house. We always worry. Kudos to you for being such a great mom who makes stellar meals! Welcome home Liv! This was such a sweet and touching story! It's when the people we love the most are gone (even for just a day or a week) that we realize we miss them the most! Great pancakes and you are so lucky to have such a beautiful family! I'm glad your daughter had a great time at camp, but you're right... it's always nice to come home especially when there are delicious pancakes like these waiting for you! Aw, haha poor Liv! There is truly nothing like Mom's cooking ;-). Your pancakes look so delicious!! Makes my mouth water just looking at them! As Always, everything you make looks so good that I can't wait to try it! Oh man! These looks so good! I absolutely love pancakes! Oh, I don't have any kids, but I can imagine how hard it would be to send them off to camp! 5 days is such a long time! I remember when I went to camp in 6th grade - it was for about 5 days too, I believe. I remember being super excited about it... I think moreso because my sister had gone two years earlier and had a wonderful time. Great stack of pancakes for a wonderful welcome home! My kids did winter camping with the schools in 7th grade in February. In February in MN! (They mostly loved it - go figure) Your daughter already knows good food - I'm sure the eggs were powdery and you know how to set all things right with these glorious pancakes. You're having such sweet days and it shows in this lovely post. Ok, so I just about started crying when I got to the part with her arms coming around your waist. Moments like that are those you hold close in your heart forever. Thank you so much for sharing that with us. And for those pancakes too, but they're no where near as sweet as that story. What a sweet and touching story about camp. I especially like the way that Liv, wrapped her arms around your waist, and told you that she missed you. I have three boys that went to Outdoor Ed over the years. When my middle son went, he fell in the river, so he just stuffed his wet clothes in his suitcase, and didn't hang them up. When I opened his suitcase when he got back, there were moldy wet clothes. I got a much different welcome home than you did. Oh my I would be a wreck if Taylor left me for camp. I'm glad she had so much fun! I bet having an amazing chef of a mother spoils her and the camp food tasted even worse because it wasn't her mom's pumpkin pancakes or pizza pretzels! I knew she missed you before you mentioned the heartfelt embrace. The excited way you said she told you tales of her camp was a dead giveaway. I wonder how many times she told herself, I GOTTA tell my mom about THIS! Or maybe even turned to tell you something and you weren't there? P. S. My daughter pinky swore she would never move out and leave me. I think I'll hold her to it. SHHHH! Don't tell my other half! What a beautiful and moving post!! My eyes filled at tears - I just love the hug at the end :) I myself can not wrap my head around the day this will come to me/my family - I have a couple more years...glad she had a wonderful experience (other than the food that is lol) and that you "survived " it!! 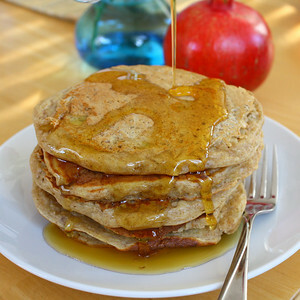 Love to see pancakes on a food blog, especially if they're whole grain! ok, i am so going to make these especially since the whole time i am reading this i am crying, happy tears and tears of totally understanding the bitter sweet of kids going away and not being homesick but knowing htat home is always the best place to be.